I ran the Upgrade Advisor on a 2-year-old Gateway MX8734 notebook that with a 1.6GHz Intel Pentium T2060 processor, 1GB of RAM, a 160GB hard drive. This system runs Vista sluggishly-no surprise given the 1 gig of memory-and based on initial reports from Redmond, I thought it might perform better with Windows 7. However, a recent PC World Test Center report says that may not be the case. The compatibility check took about 6 minutes and found a few potential issues. 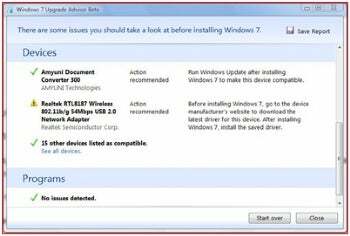 While the Gateway's processor, memory, and hard drive met Windows 7's minimum requirements (I expected this), Upgrade Advisor recommended that I download the latest driver for the Realtek Wireless 802.11b/g USB 2.0 network adapter before installing Win 7. It didn't find potential conflicts with any installed programs. 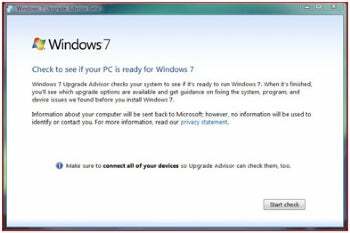 Upgrade Advisor also pointed out that Windows 7 doesn't include Web filtering (Windows Mail and Parental Controls), and it included a link to Microsoft's Windows Live Essentials site, where you can download the free Family Safety utility.